Your bladder is a balloon shaped organ in your pelvic area that stores urine. Like many other organs in your body, the bladder can develop cancer. In adults, the most common bladder cancer is Transitional Cell Carcinoma. Other less common bladder cancers include Squamous Cell Carcinoma and Adenocarcinoma. 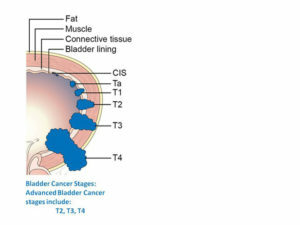 Bladder cancers start in the cells that line the inside of the bladder. When bladder cancer is found at an early stage it is highly curable. Risk Factors for bladder cancer include smoking, exposure to certain chemicals and history of chronic bladder inflammation. Typically, these risk factors apply to Transitional Cell Carcinoma. The early stages of bladder cancer are typically asymptomatic. In most cases it is detected by the presence of blood in the urine either under the microscope (microhematuria) or visible to the eye (gross hematuria). Consultants in Urology, a division of Premier Urology Group, provides the latest technology in diagnosing and treating bladder cancer. 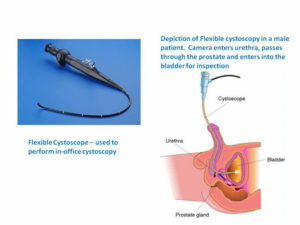 If bladder cancer is suspected, most commonly secondary to the detection of microscopic blood in the urine, a simple outpatient test termed Cystoscopy is performed. This test detects the absence or presence of a bladder cancer. Once detected, the cancer is removed via a telescope and the stage of the cancer is determined. Depending on the stage of the cancer further treatment is advised. Majority of patients with early stage bladder cancer will be required to undergo surveillance cystoscopy every three months to ensure there is no recurrence of the bladder cancer. Advanced bladder cancer represents those patients whose tumors have penetrated into the muscular lining of the bladder. TURB (Transurethral Resection of Bladder Tumor): This is typically an outpatient surgical procedure to remove the bladder cancer from the lining of the bladder via a telescope or cystoscopy (no incisions required). This surgery will help determine the final stage of the tumor. For early staged cancers the surgery is often curative. Immunotherapy: This is an office procedure during which we instill an immune-stimulating bacterium, termed BCG, into the bladder via a small catheter. BCG has proven to be effective in reducing the progression and recurrence of bladder cancer (transitional cell carcinoma). Typically we instill the medication in the bladder once a week for six weeks. Chemotherapy: Chemotherapy for early staged bladder cancer (transitional cell carcinoma) is used locally in the bladder. It is not given into the blood or intravenously for early staged cancers. Mitomycin, a chemotherapeutic agent, is instilled into the bladder via a small catheter. Mitomycin has proven to be effective in reducing the recurrence of low grade bladder cancers. 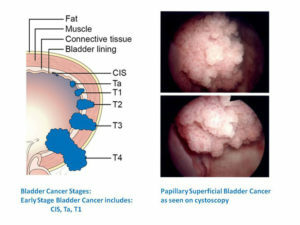 Partial Cystectomy: This surgery is indicated for a small select population of patients who have an isolated focus of advanced bladder cancer. This surgery involves surgical removal of the portion of bladder that contains the cancer. Radical Cystectomy: When bladder cancer penetrates into the muscular lining of the bladder the bladder needs to be removed to provide the highest chance of cure. The entire bladder and surrounding lymph nodes are removed. We offer three options of treatment to reconstruct a new storage area for the urine. The simplest solution is termed “Ileal Conduit”. This involves a stoma or bag on the abdomen that collects the urine. Another solution is a “Continent Urinary Reservoir or Indiana Pouch”. This involves creating a pouch from the intestines to store the urine inside the abdomen. A small catheter is inserted through a tiny hole in the abdomen a few times a day to drain the urine from the pouch. No external bags or stoma are required. The last solution is creation of a “Neobladder” This surgery involves creation of a new bladder using intestines that attach to the patient’s urethra allowing the patient to void normally. Chemotherpay: Patients with advanced bladder cancer may also require intravenous chemotherapy. Depending on the patient, chemotherapy is used in conjunction with a cystectomy, either given before or after the surgery. It can also be offered without a cystectomy in those patients who cannot tolerate surgery. Radiation Therapy: Although this option of treatment is generally not curative, it can be used in patients who cannot tolerate surgery (cystectomy) in an effort to reduce their symptoms and shrink their cancers. No matter what type or stage of bladder cancer you may have, our physicians are committed to providing you with the most advanced and compassionate care. Many patients with neurologic conditions that affect the brain, spinal cord or peripheral nerves experience issues with their bladder. Since the bladder control center is located in the brain, brain conditions such as tumors, stroke, hydrocephalus, dementia and Parkinson’s can all affect a patient’s voiding. The signals from the brain control center travel down the spinal cord to reach the bladder. Conditions that affect the spinal cord including traumatic injury, herniated discs, spinal stenosis and laminectomy surgery can also affect the bladder. Lastly the peripheral nerves carry the final signal to the bladder muscle. Pelvic surgery or diabetes can affect the peripheral nerves and inhibit normal voiding. Using our expertise at Consultants in Urology, a division of Premier Urology Group, we can accurately diagnose how your neurologic condition may be affecting your voiding. We have state of the art urodynamics that help distinguish the extent of the problem and provide individual patient tailored treatment.